What do the different colored Shields mean? Each Shield indicates to what extent the selected app is protected on the given keyword. Green Shield = Protected keywords: the keywords on which you are bidding and for which your app has the highest SOV (visibility). Try increasing the amount of your protected keywords as much as your can. Yellow Shield = Unprotected keywords: the keywords on which you are not bidding and no other apps either. These could represent a threat, as other apps can start bidding on these keywords and make you lose some visibility. At the same time, these represent an opportunity to protect your visibility and bid on these keywords. Orange Shield = Defended keywords: the keywords on which you are bidding but for which your app doesn’t have the highest SOV. It’s a good thing to be present, but be careful: other apps are more visible than your app on some important keywords. Red Shield = Attacked keywords: the keywords on which you are not bidding, while some other apps are. 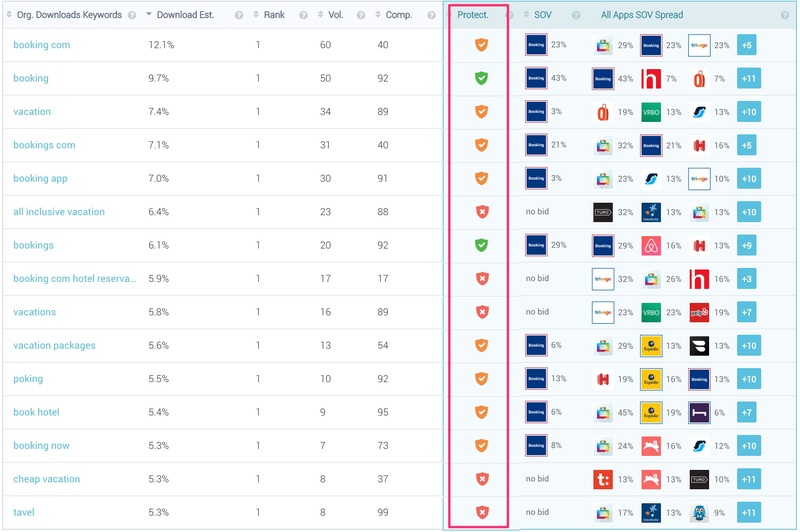 Your app is definitely being attacked on these keywords by other apps! Make sure to bid on your attacked keywords if you want to increase your protection level. Check out this post for more details on the Multiple Scenarios possible.